It's snowing hard and is very nasty out. Kids are home for the day from school and I am desperately waiting for a call from the hubby. He drives and delivers Coca Cola to stores and I haven't heard from him since early this morning. So I need a diversion and some thing QUICK fixed! Rnd 12) ch1, sc in each st around, fasten off weave in ends. 12 rounds! Great and realy quick.Plus looks good! Hope you hubby is o.k. Pretty hat. I think I will give it a go. We have been stuck at home all week with snow and ice. My kids and I are suffering from Cabin Fever and are really getting on each others nerves! I need a hooky escape! So pretty and so quick! I did this hat up in no time and my 5 year old loves it! Glad your hubby made it home ok. I hope your husband's ok! I understand that you worry! How would I go about making larger for my mailman? So pretty! Hope your husband was fine. I understand! My husband does custom farm jobs and is always out in this nasty weather and sometimes is in areas with no cell coverage. It's enough to drive a woman a little crazy. Thanks for the pattern. This hat is so pretty and I am going to give it a go right after I finish crocheting a baby blanket. So glad your Hubby made it home safely and you are back to posting patterns again. They are easy to follow and work up quick. Love the hat pattern...thanks for sharing and glad to hear your husband was okay! Phew! This is just the right look I have been searching for. I would like to crochet a heathered gray hat for a little girl across the street; she just turned one. For her, I'm going to attach a gigantic crocheted flower as well. Thanks for sharing your patterns and talent with us! I love it! I will definitely be making a couple for my girls this winter. I love this hat! Thank you for publishing your pattern. I am going to make two as gifts for my nieces this Christmas. Thanks for the pattern. I am going to make it as soon as I can get to the store and buy some yarn. My Granddaughter will love. If I wanted to make this hat for an adult, how would I increase the size? Its very cute. I made it today... but it fits me instead of my niece, I must crochet big, it measures 22 inches round. What does yours measure? I hope this helps all who want to make this for a teen or adult. Again, GREAT pattern for child or adult! Thank you for your advice. This "little bit larger" hat is just great. I never crocheted a hat before, but am going to give this one a try. It doesn't look very hard. And is adorable. So happy to find your site. Thanks for the precious hat pattern! and thanks also to KHAdams for the adult sizing :):) There are so many nice crocheters in this world! But my husband and I have chosen to move to ND this June and are very much looking forward to snowy winters. It's been years for us both and we want to experience 4 distinct seasons again, including snow! So, I am looking forward to making more hats and even using wool and being able to use it! Very cute and easy to whip up! Thanks I think I will put a cute flower on the side and my grand-daughter should love it! So cute! I saw this on Ravelry & knew I had to make it for my 10 yo daughter. Thanks! Claudia...double strand means using a strand of yarn from 2 balls at the same time. Gotta Make a few of these for Christmas this year. Thanks for this pattern- its great! Made several for kids, and adults. We tried the pattern with a 5 bulky yarn, single strand. My daughter skipped round 2 and did round 3 twice. The had came out large and slouchy so she did a few extra rounds at the end to decrease making a band so it would fit. 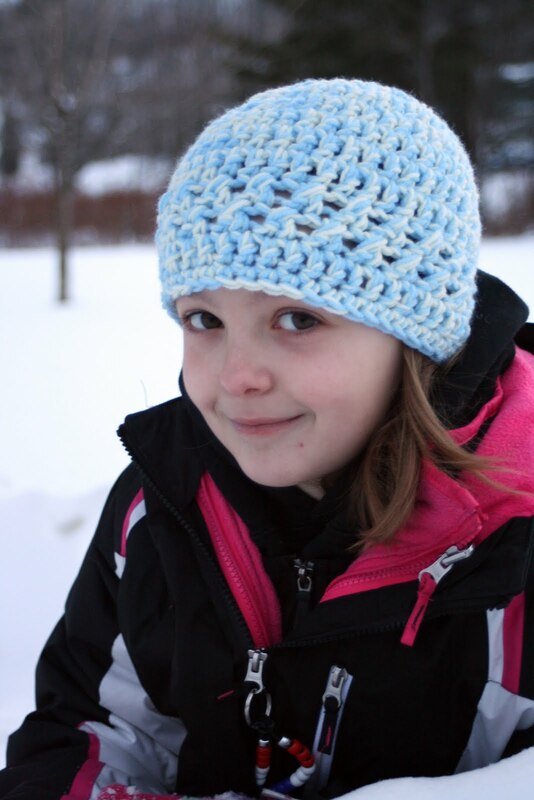 Looks nice and great for my daughter's first attempt at a hat but nothing like the one pictured here. I also did it using red heart supersaver size 3 yarn, single strand and ended up with a baby hat. So, depending on what yarn you use, this pattern can be quite versatile. How many chains would I start with to make a hat for a 3 year old? Awesome! Just made one this morning for my little girl's upcoming b-day! I am new to crocheting... Followed the pattern but made a few adjustments to make it fit my daughter's head better. Beautiful, simple pattern! Thank you so much for sharing! I plan to make more of these for another daughter, a son, and definitely for myself as well! Thanks again! Rnd 9+10) ch3, working in front of ch3, dc in last st of previous round, * skip next st, dc in next st, working in front of dc, dc in skipped st, (this creates a cross stitch effect) repeat from * around, sl st to top of ch3.....HELP! So on round 9 & 10, you chain three, then you work a double crochet into the stitch to the right of the chain three which is also the last stitch you did to finish the round. Then going back to the left of the chain three, which is the normal direction in which you crochet, you skip the next stitch and work a double crochet in the next, once you work the double crochet, work a double crochet in the stitch to the right of the just worked double crochet which is also the skipped stitch. You continue this same pattern around. It took me a couple of tries to figure this out but once you get it, it's really easy to do. Hope this helps!! Great! Thank you Toni, I just found the pattern but haven't started yet. I am planning on making it soon for my brother and I'm glad I found your instruction for 9 and 10. I truly dislike running into problems. Thanks, Toni. I had no idea what that meant. I want to try this pattern. Have a blessed and merry Christmas, everyone! I love this hat so cute and easy. I love quick and easy!!! How do I print out the instructions without getting all the other stuff on the webpage? It looks like a great pattern! I alternated between a single and double crochet for rounds 2-8, gave the top a bubble affect. Very quick and fun pattern. Thank You! This is a great pattern, thanks so much for sharing it. If I wanted ro make a slouch hat with pattern , how would I ? 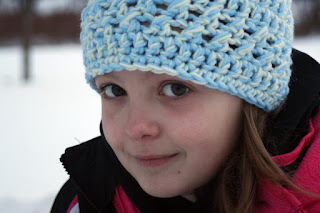 I just 'stumbled' across your hat pattern - thanks for sharing! Will make 2 right away for grandchildren. We live in Michigan - northern lower peninsula - and have a ton of snow now. I have always wanted to visit Maine....looks beautiful. Ever seen the Sarah Plain and Tall series? My favorite! Wanted to say that although your blog was written a couple years ago, I have twin sons that work for Coca Cola - good company to work for. Have a great day - and Holiday season. Love this beanie! I've made two already! Thank you. You might try using a larger hook to make a larger size hat. Thanks for sharing the pattern. I love this beanie. Thank you for the pattern. My two little grand daughters live in Colorado. I have already made one and about to start on the other one. Hope they fit. Their ages are 3 and 4. Thanks again. Thank you for sharing this wonderful hat pattern! It works up very quickly and I was looking for a quick, cute hat for a friend's granddaughter. Made it in cotton candy colors using a soft pink solid and a variegated pink/peach/lavender/purple combo by Deborah Norville. It is adorable! Merry Christmas to you and yours! I made this hat today using very old worsted weight wool, single strand and a J hook. I did 2 extra increase rows and 2 extra rows for height, then the two cross stitch rows. I was worried about the double crochet at the end adding two much height so I did 2 rows of single crochet to end it. It came out very nice. It is a present for my sister. I did this hat today. But following the pattern it seemed awfully long for a child's head. I went back and took out the last row of double crochet and the second row of cross stitches, but still seems too long for a child's head. I am very grateful to you and please keep sharing these kinds of products.Your blog article is really very information and beneficial as user point of view. Valerie I love your hat! I plan making a bunch and taking them to Manna. Bill Rae is asking for hats and mittens for homeless and low income. Oh, I am from Maine too, Brewer. Super easy to work up. I used one strand of super bulky (Bernat Viva) and it is the perfect size for the 3 year old recipient. Thanks! Love this pattern!! The beanie comes out beautifully !!! Making them for our church's annual Tea. Thank you for the pattern. I have difficulty reading white on black. I have tried to changing this in word so that I can use the pattern but could not do it. Found this while looking for beanies. Never have done double strands, but here goes..Love the pattern. Thanks! Love this pattern! So quick and easy, but nice!! I am new to crocheting but I have size hooks: E, G, F, and I. Can I maybe use one of those? Sami, I'm not an expert at all, but a K hook is larger than those you have. Your I hook would be the closest, but the hat would turn out smaller. It would probably be much simpler to just borrow or buy a K hook. Also be sure to read Toni's post about rows 9 & 10 if you are a beginner like I am. This makes a cute hat! I made this hat last night and it turned out well. I wanted it to be adult size, so I meant to do what someone posted above, repeat row 3 IIRC, but I forgot and wound up repeating Row 4 to get more circumference and height. 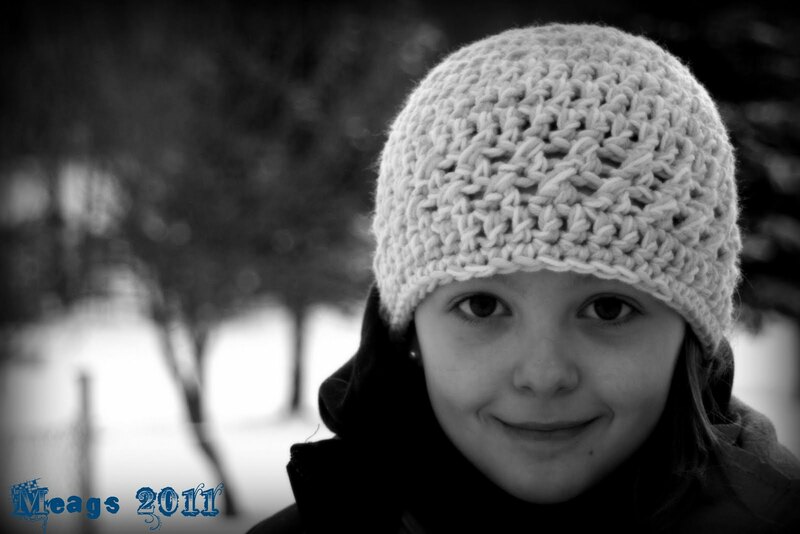 I would have never figured out the "cross stitch" rows, however, without Toni's post above on Jan. 1, 2013--THANKS, TONI! The hat fits my head, snugly, but I can tell it will be warm. I used double strands of Caran yarn and a K hook. I had two skeins and had some of each left over. Thanks for sharing this cute and easy (with Toni's help!) pattern. Have a blessed and merry Christmas, all! I should have added to my post above: On the first round where you do one DC in each stitch, I did do a slight decrease (did one DC in four or five stitches, then skipped over a stitch and did four or five as written, etc.) because I was afraid the hat was getting too wide. It might have been fine without doing that, as it turned out to fit snugly. Also, thanks KHAdams! I did repeat round 4 as you suggested, although I had remembered incorrectly, LOL. It turned out OK even with my spur of the moment decrease. I so love this pattern!! I used one strand of Red Heart Soft Essentials with the K hook and it came out perfect..thank you!! I'm a guy learning to crochet and LOVE it!!! Any other guys out there crochet?? Thank you for this great pattern. It's wonderfully easy and fast. It's also great for using less than a skein of yarn, and thus remnants. Using up yarn and making hats for Mission to the World Knit for Kids. Doesn't get better than this. Thank you for the pattern. I have made several hats for a young girl who is going thru chemo.